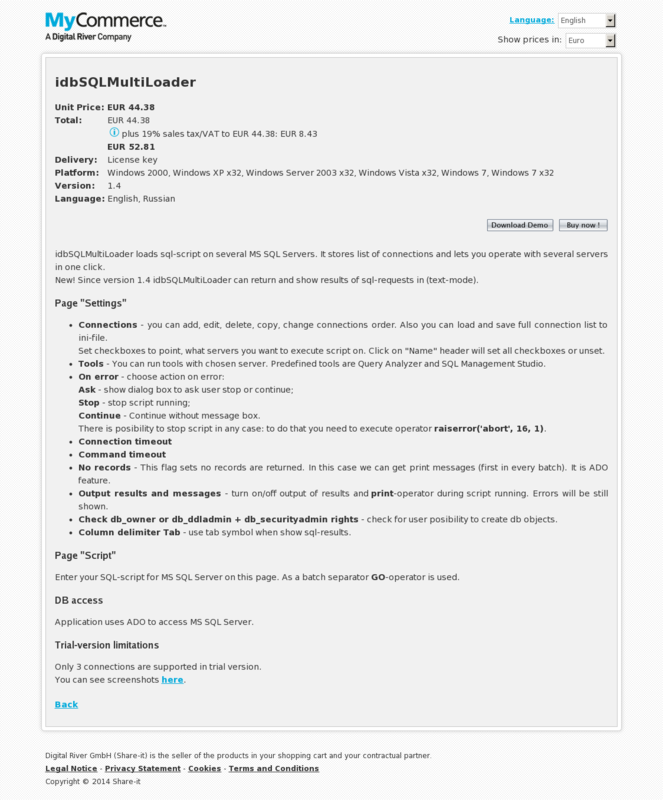 idbSQLMultiLoader loads sql-script on several MS SQL Servers. It stores list of connections and lets you operate with several servers in one click. New! Since version 1.4 idbSQLMultiLoader can return and show results of sql-requests in (text-mode). Connections – you can add, edit, delete, copy, change connections order. Also you can load and save full connection list to ini-file. Set checkboxes to point, what servers you want to execute script on. Click on "Name" header will set all checkboxes or unset. Tools – You can run tools with chosen server. Predefined tools are Query Analyzer and SQL Management Studio. Continue – Continue without message box. There is posibility to stop script in any case: to do that you need to execute operator raiserror(‘abort’, 16, 1). No records – This flag sets no records are returned. In this case we can get print messages (first in every batch). It is ADO feature. Output results and messages – turn on/off output of results and print-operator during script running. Errors will be still shown. Check db_owner or db_ddladmin + db_securityadmin rights – check for user posibility to create db objects. Column delimiter Tab – use tab symbol when show sql-results. Enter your SQL-script for MS SQL Server on this page. As a batch separator GO-operator is used. Application uses ADO to access MS SQL Server. Only 3 connections are supported in trial version. You can see screenshots here.